Why Isn't Mobile's CSA around 1 Million ! I also noticed several ,of course Baldwin County tags,Washington County,and Escambia County, Alabama Tags that work and shop heavily in Mobile as well especialy with the new industry. Over all Mobile 6 county CSA Poulation - 967,716 it&#39;s now 2008 and should be a little over 1 million i&#39;m estemating around 1,020,000. What will it take for the U.S Census to include these Counties in Mobile&#39;s CSA and what if Escambia County ,Fl (Pensacola)- 294,410 is included in Mobile&#39;s CSA the population would be a whopping 1,262,126 .Based on the 2006 U.S Census ,but since it&#39;s 2008 it would realy be around 1.3 million. Somebody please inform me on this !!! But first off, I think you're confusing MSA and CMSA (?). Birmingham's MSA (Metropolitan Statistical Area) is over a million with the 7 counties included with the MSA. Birmingham's CSA includes the Cullman County MSA for a total of 8 counties. Mobile's CSA consist of Mobile and Baldwin county (according to the site I'm looking at) and only those two. From the looks of the data I see, there isn't even enough commuter overlap for Mobile and Baldwin to constitute a whole MSA together. Mobile and Baldwin are listed as seperate areas while Baldwin is only considered a Micropolitan Statistical Area. MSA is established based on commuter's basically from one location to another in order to determine is a specific city and/or county should be included in an overall MSA. When considering Birmingham, the majority of all jobs are located in Jefferson and Shelby counties and the majority of all workers are located in the 5 other counties and Shelby. In the case of Mobile, most all of the job and workers are located in Mobile and Baldwin counties. People who live in Mississippi most likely work in MS. They may commute to Mobile for shopping and other things, but odds are they stay in their respective counties for work or counties within the two MSA's on the coast of Mississippi. And if anything, people in the Gulfport-Biloxi MSA would most likely commute into New Orleans MSA for work and/or shopping. I would imagine the Gulfport-Biloxi MSA has a better chance of being combined into the New Orleans MSA than it does Mobile's CSA. And at some point years from now, you may see Mississippi's other coastal MSA combined into the Mobile CSA but I don't imagine any time soon. I think we'll see Tuscaloosa combined into Birmingham's CSA before Mobile's CSA gains any other areas. I have looked on a few sites and now, they are only including Mobile County in the MSA for Mobile. Once the Eastern Shore got to be what it is, it broke off into its own MicroSA. 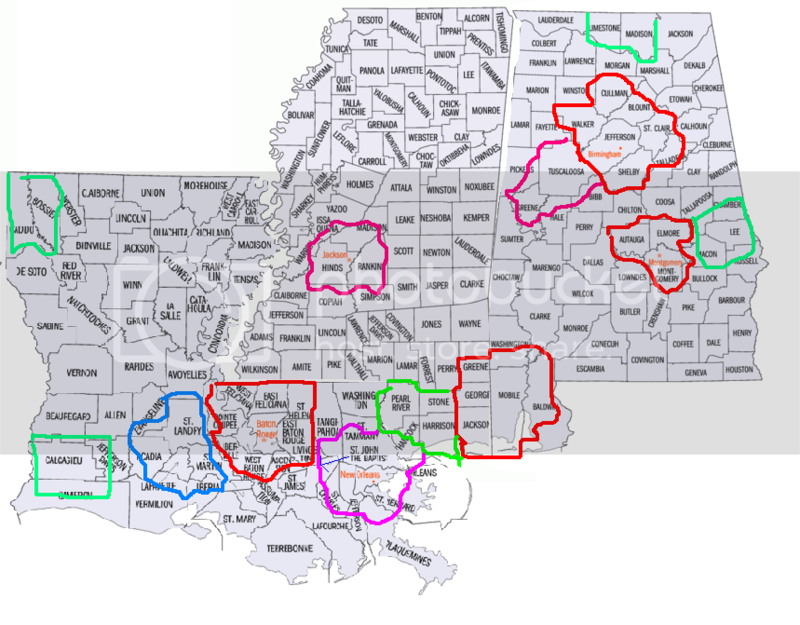 What i want to know is why Baton Rouge, which shows a MSA of 750,000 can include 9 surrounding Parishes, and just not have a CSA, but Mobile can only have one county included in its MSA. I know of myself, many people who either live in Mobile and work in Miss. or live in Miss. and work in Mobile, and the same for Washington and Clarke Counties, and of course eastern Baldwin County. I think with Mobile's economy booming like what its projected to do the next 5 years, they should start to include atleast part of Baldwin, Jackson, George, Greene, Washington, and Clarke Counties. Harrison and Hancock Counties in Miss are separate and their own MicroSA for sure... but there are plenty of commuters to Pascagoula and Gautier, and other places north of there just across the state line. Here's what i think the Mobile MSA and other MSA's should and/or are including in the area...I'd like any comments/suggestions! I get what your saying Harrison county is a little iffy , but I do see several Mississippi tags In Mobile county especialy out west and these people do work and shop in Mobile !! I live out in the Semmes area and I they make up a huge portion of the traffic out there I see several Jackson and Greene count y tags all the time. Why would they want to shop in Lousiana and Mobile is right there less than 15 minutes from the Semes Wilmer area your in Mississippi. I also forgot about Goerge and Clark county . I know that the Cinccinatti `s CMSa sprawls over into Kentucky so does Chicago&#39;s CMSA sprawls into Indiana. If they did decide to include the portions of the CSMA of the counties mentioned the Mobile CMSA will still be around the 1 million mark. I assume within 3 to 5 years the mobile CMSA will be over a million either way it goes. If not still there is well over a million people living in the Mobile area . ^^^^^ good point. I think the MSA will be changed in 2010. They took Baldwin out over estimations a few years ago. A county has to have at least 24% commuting to the center county or something like that to be included in the Metro. Right now 22-23% of Baldwins work force commutes to Mobile. And that was the estimation back in 2003. I think it has probably increased...hint the heaver traffic on the bayway and the fact that baldwin county's job market isn't growing as fast as Mobile's. I think Baldwin will be in the Metro again. Oh and maybe with the steel mill, Washington county could possibly be in our CSA by then also. But mostly the decisions are based on very incorrect numbers. The census does a horrible job at estimating population and trends. Why do you think they have so many law suits filed against them every few years by different cities. Im just going to give my two cents, since I noticed Baton Rouge was mentioned. I visited Mobile during Mardi Gras, it was a very nice city with a great downtown. But there is no way that one can claim that the Mobile CSA is 1,000,000. Baton Rouge's CSA is 790,000. Baton Rouge has 1 million times more shopping options, and upscale shopping at that, then Mobile. I believe this to be a big factor is determining the strenght of the local economy and overall CSA size. If one truly believes that Mobile's CSA is 1 million, then how come Mobile has very few shopping options compared to a city with a CSA of 790,000? Thats just my two cents, any comments? The Huntsville-Decatur Combined Statistical Area with 526,302 living within the CSA. It is also currently the 93rd largest CSA in the country. At least 1 more county will probably be added (Tennessee) after the next census. Mobile county is very slow when it comes to stuff like that . Baldwin County which is much smaller than Mobile county has more shopping options, Huntsville which is smaller has more shooping options, and I even think that Montgomery dose also which is smaller than Mobile. I also heard through rumors that the developer who built the Mall of Lousiana in Baton Rouge wanted to build it in Mobile first but they turned him down. I don&#39;t know how true that is and don&#39;t care my point being is that Mobile county is known for turning down development such as that . In the past the county has even turned down theme parks that were presneted to us. It&#39;s a new time now and we have a lot of catching up t0 do . Mobile&#39;s CSA is not 1 million it is only 565,000 + ,according to 2006 census which may be very close to 600,00 being that it&#39;s 2 years later now . My point for this thread is that I feel that Mobile is being cheated out of especialy CSA population,City , and county population. The CSA outline that MobileLSUBoy put on an earlier post the population estimates were around 800,000 . The counties that I included was 967,917 based on 2006 census and with it being 2008 I estimated it to be be around 1 million now thats the reason for the thread. But these have nothing to do with each other. A CSA is nothing more than a collection of communities lumped together by the U.S. Office of Management and Budget (OMB) (its not the census that does this). These are based on commuting patterns, and what is missed by many people also dependent upon local preferences. That means counties can lobby to not be included or included in a CSA and even an MSA which often happens. These designations are only useful for allocating money of certain federal programs and don't say anything about the urban nature of the cities in them. The central city of a CSA/MSA could be 100% of the population, or only a fraction. Population growth in a MSA/CSA does not mean that surrounding counties will be added. If you have to get into these contests of judging cities on their population and inferring some kind of concept of its relative urban nature, then your best bet is to look at the urbanized area and population density, or if you must, then stick to MSA and county populations. Well either way... Baton Rouge has way better shopping/dining/business options than Mobile unfortunately. I think your comparison of shopping/dining/business options in Baton Rouge and Mobile is exaggerated. I have been to both cities many times and the biggest difference I have seen is the affect of state government and the LSU campus. But to say "Baton Rouge has way better..." is just not accurate. I think Mobile has adequate shopping/dining/business but what is not considered are the options in Baldwin county. Like Thyssen Krup, given the choice between the two cities I would have to take Mobile which seems to have clearer direction and a brighter future. In my opinion Mobile is poised to become one of the South's leading cities in the next 25 years. I wouldn&#39;t mind seeing Mobile in the next 5 or 10 years with the same shopping accomidations as Baton Rouge I would say B-ham but I fill that Mobile has more close ties with Baton Rouge . I have been to Baton Rouge before and liked it there , they also have a huge water park. Which is something that Mobile needs and great shopping. I dis agree with the dinning because I truely believe that we have the best ! !